Facebook can now be accessed freely via Mark Zuckerberg’s global internet expansion plan to make basic internet available for developing countries. Facebook have partnered with U2opia and branding as Fonetwish to let users access content from any cellular phone. Even a basic phone which does not even have GPRS facility can utilize this facility. To avail its full capabilities, you will need to subscribe the Fonetwish premium plans which are very low in price. At this moment, it allows you read/send text-based updates. It uses USSD technology (Unstructured Supplementary Service Data). Just the way we see balance inquiry and use input methods from numbered options, this system works. If you wish to use basic Facebook.com, follow this simple tip. Also see "Best Facebook Tips/Tricks Updated 2015"
Dial *325# or *fbk# and you will get a confirmation message asking for username and password for your Facebook account. It will not charge any charges for this. Follow below screenshots. 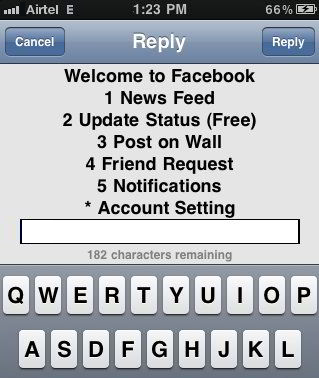 You will get notifying options such as Update status, News feed, Post on the wall, Friend request etc. Extra options such as checking notifications, adding friends, posting on a wall are not free and need subscription charges. You will need to pay Rs. 1 for full day unlimited access. To unsubscribe Fonetwish dial *325*22# from the same number and service will be disabled instantly. Its major limitation is only 140 characters typing allowed, just like twitting on Twitter.